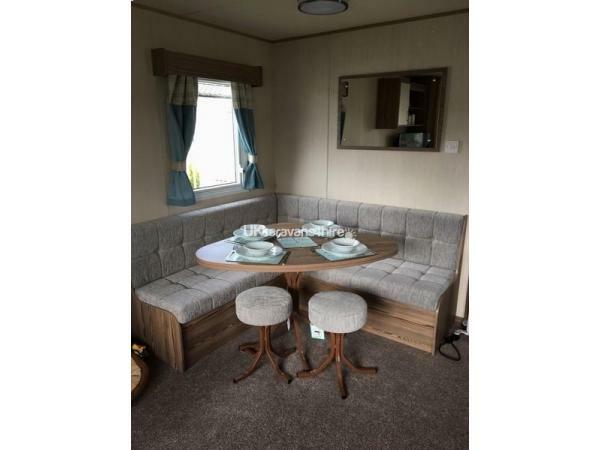 A New Deluxe 3 bedroom Abi Horizon caravan for hire on Thorpe Park, Cleethorpes. 1 Double bedroom with fully fitted wardrobe and 2 bed side tables and 2 twin bedrooms with ample wardrobe space and table in between beds . Eco blow Air heating in all 3 bedrooms. There is a large open lounge with ample seating with pull out double bed, gas fire, 32” Smart TV with free-view, DVD player, DVD's and PlayStation 3 console and games. There's also family games and activities for you and your family to enjoy. All gas/electric is included in the price, all double & single duvets & pillows, along with bed linen, made up on arrival. Lazy river and outdoor slides open July and August. Note Passes are not included but can be purchased from reception if you wish to make the most of the on-site facilities. Lovely clean and comfortable caravan, owner has made this a home from home. Board games, books dvd's and games console, also lots of information on the park and surrounding area. Close to amenities but not so close you are disturbed by noise. Fantastic customer service from beginning to end. Ifp I could give more stars I would. Thank you Naomi, we will definitely be visiting again. We have just stayed in Naomi's caravan and from the moment we went in it had the homely feeling straight away, The caravan was spotless, it has all the facilities, with books, games, dvds, PlayStation & games for children, all ages catered for, everything was in the caravan, the bedrooms were comfortable and a added bonus of two toilets. Both the park & the caravan were absolutely fabulous and I shall recommend to family and friends. beautiful caravan, superbly located near a stream bursting with wildlife far enough from entertainment complex to not be bothered by noise but not to far to walk there yourself,even for little legs.excellent facilities and entertainment and close to a lovely beach. would highly reccommend. 5* caravan. Very pleased with the accommodation and the location on site. The caravan was spotlessly clean throughout, the beds were very comfortable and the kitchen area was well stocked with every utensil you could need. There were plenty of games and dvd's for a rainy day too. Communication with the owner was excellent. We would definitely book again. We are a family of four children aged 6 and 8, we went for the weekend to celebrate our daughters 8th birthday, beautiful caravan, situated in a lovely quiet location but still within easy reach of the park facilities, we will most definitely be returning. Our Kids loved every minute and so did we. Short break for a weekend break, lovely caravan ideal for what I wanted and close to amenities. Lovely walk to entertainment site with plenty to do. Glad you enjoyed your stay ???? had a lovely short break in this beautifully kept caravan. really nice site. close to all amenities and pleasant walks. really helpful owner. Fabulous caravan, immaculate. Owner is absolutely lovely nothing was too much trouble. I took my granddaughters and will definitely book with this lady again. Lovely caravan, not far from beach and all amenities. Owner was very informative and quick to reply. Would book again. Beautiful caravan not far from the club and the on site shop ,beach is only 5 ,10 minuets walk great for young kids will definitely stay again in the summer time.